Shchedrin expected a great deal from the “eternal city”, and it lived up to its promise, as reflected in a letter to his family: “This is the best time of my life, now that I am in strange lands, in the company of good artists of all nations, in the company of friends and visitors from Russia” . In Rome he painted a view of the Colosseum, which, by order of Emperor Alexander I, was mounted in the Russian artists’ gallery at the Hermitage (“The Roman Colosseum”, now in the Russian Museum), as well as numerous landscapes with the Castel Sant’Angelo. And yet, it was Naples, rather than Rome, that played the most important role in Shchedrin’s development as a landscape artist. 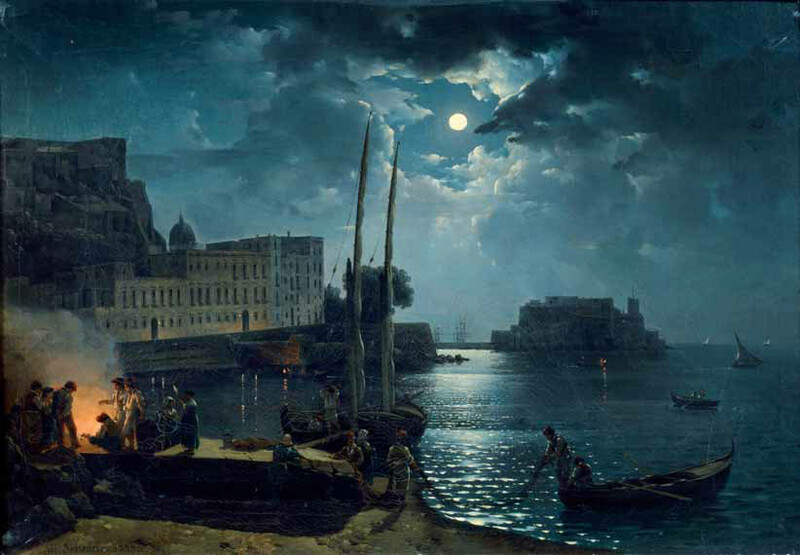 Shchedrin first visited Naples in the summer of 1819, to paint views on a commission from Grand Duke Mikhail Pavlovich, eager to own pictures of the city. The boisterous Southern city and its scenic environs captivated the artist, who discovered a new “environment” for landscape paintings. In 1825, when his fellowship term was over, Shchedrin again visited the Gulf of Naples area. In the second half of the 1820s his art reached a spectacular zenith. 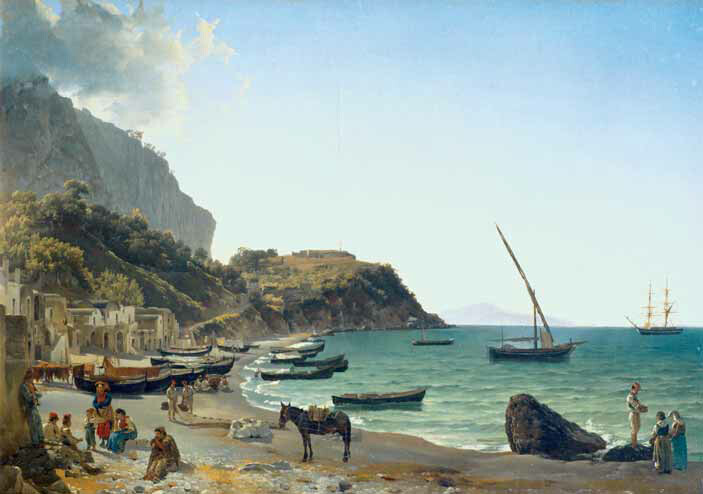 During the five years of arduous work Shchedrin created many views of Naples and its neighbouring villages, along the coast and on the islands, dating back to antiquity — Sorrento, Amalfi, Vico, Capri, and others. Shchedrin was never to return to his homeland; he died in Sorrento, not yet aged 40. The artist was buried in a local church, St. Vincent’s, and his close friend the sculptor Samuil Galberg designed his tombstone, which was set in place a few years after Shchedrin’s demise. Shchedrin’s Italian landscapes in many respects changed the canon of Classicist landscape that had dominated Russian art since the second half of the 18th century. Rejecting the tradition of landscapes adorned with historical buildings and landmarks, the painter opted for authentic outdoor scenery, which his brush transformed into the symbol of harmony between the forces of nature and human existence. One of Shchedrin’s greatest achievements was his creative method — painting from nature. Shchedrin not only commenced but also put final touches on his pictures outdoors, forever keen on capturing and rendering the characteristics of colours changing in tune with the air and lighting. “... I paint only outdoors, so it takes long,” he wrote to his mother in St. Petersburg . Living in Naples and touring its surrounding areas, Shchedrin was always delighted to talk with the locals. Neapolitan fishermen, itinerant monks and “lazzaroni” (beggars) are important figures in the world created by the artist — a world where humans and nature always seem one whole. Shchedrin was not alone in his quest for a new content and means of expression in landscape painting. When afforded a chance to meet with “good artists from all nations”, the Russian artist found himself in a company of painters coming from different stylistic traditions. The tradition of Classicist landscape still dominated, but it was flanked with new trends, including Realism. The exponents of the latter included mostly artists from Naples who were members of the so-called “Posillipo school” (Scuola di Posillipo), founded by a Neapolitan landscape artist of Dutch origin Antonio Pitloo (1791-1837). When he headed, in 1815, a department at the newly reorganized Naples Academy, Pitloo gathered a group of young artists who painted local scenery. The artists from the Posillipo group painted, outdoors, small-sized pictures — this to a large extent accounts for the sketchiness and “casual”, relaxed manner of Pitloo and his associates. In his letters Shchedrin several times mentioned Pitloo favourably, talking about the “light touch” and “enjoyable palette” of his paintings. It is known that Shchedrin was acquainted with two of the school’s most famous artists — Raffaele Carelli and Giacinto Gigante. The latter, as can be inferred from Shchedrin’s letters, was his student . Since the school’s period of flourishing largely coincided with the 1830s-1840s, it would be reasonable to assume that Shchedrin not only assimilated its approach to painting, but left a certain mark on it as well. ings were held at the Hermitage and the Academy of Fine Arts. Interestingly, all his works, including the unfinished ones left after the artist died in Sorrento, became the object of special attention of the Russian authorities. The president of the Academy of Fine Arts Alexei Olenin in a missive to Vice-Chancellor Karl Nesselrode asked him to do whatever possible to return the artist’s heritage to his homeland. Olenin believed that if the paintings were sold in Naples that would be “a big loss for Russia”. The paintings were sent to the artist’s brother Apollon, who passed some of them to the Academy. In the second half of the 19th century famous collectors from Moscow and St. Petersburg, including Fyodor Pryanishnikov, Ivan Tsvetkov, Ilya Ostroukhov, Nikolai Bykov, and Kozma Soldatyonkov, were eagerly buying up Shchedrin’s landscapes. Pavel Tretyakov was no exception. Even the first, hand-written inventory of his collection, made in 1873, lists nine pieces by the celebrated artist. Especially noteworthy among them is the “Self-portrait”, accomplished by the 26-year-old artist in 1817, shortly before he left for Italy; the picture belonged to the Shchedrin family. The Tretyakov Gallery’s archive holds several letters to Pavel Tretyakov from the artist’s brother’s widow Yelena Ivanovna and his son Alexander. It appears from the letters that Yelena Shchedrina decided to part with the family heirloom, accepting a much lower price than initially hoped for, in 1870, after repeated urgent demands on the part of her son and, perhaps, Tretyakov himself. The Tretyakov Gallery holds one of the earliest of Shchedrin’s presently known landscapes — “View of the Tuchkov Bridge and Vassilievsky Ostrov from Petrovsky Island in St. Petersburg”, from 1815. The composition of the landscape is in keeping with the 18th-century academic canons that Shchedrin so aptly learned as a student at the Academy. In line with that tradition, the young artist created a three-plane panorama combining an imaginary outdoor setting and the image of a really existing building. The foreground features an unusual genre scene: a bunch of St. Petersburg commoners side by side with a group of elegantly dressed young gentlemen. Among the latter, observers can spot the artist himself, who, painting the view unfolding before him, seems to certify its authenticity. The technique of panoramic painting learnt by Shchedrin at the Academy can be also observed in the pictures created during the first years of his stay in Italy. “Naples. On the Banks of the Riviera di Chiaia” was probably one of the landscapes created on commission for Grand Duke Mikhail Pavlovich. Astounded by the exuberance of the Naples residents, the artist fondly chronicled their lives which “looks like a stage production in which many persons play and even more watch”. In this picture, too, Shchedrin depicted himself amidst the bustling crowd, thus emphasizing his involvement with what was going on. Yet another self-portrait of the artist can be spotted on the painting “Waterfalls in Tivoli”. The landscape, made in the early 1820s, was received by the Tretyakov Gallery in 1929 from the collection of Ilya Ostroukhov, who, in turn, bought it from a son of the famous St. Petersburg collector Nikolai Bykov. Shchedrin’s choice of water as a natural force to portray was not accidental. For instance, in 1821 he noted: “Almost all of my paintings made last year have been bought up; everyone looks for depictions of water in my pictures, and prefer pictures with that to all others, for many art lovers deem that I am very good at painting water; indeed, I am fond of it, for which reason I make outings to localities with rivers and waterfalls”. Shchedrin liked to work in the environs of the ancient city of Tivoli, located by the Aniene river. 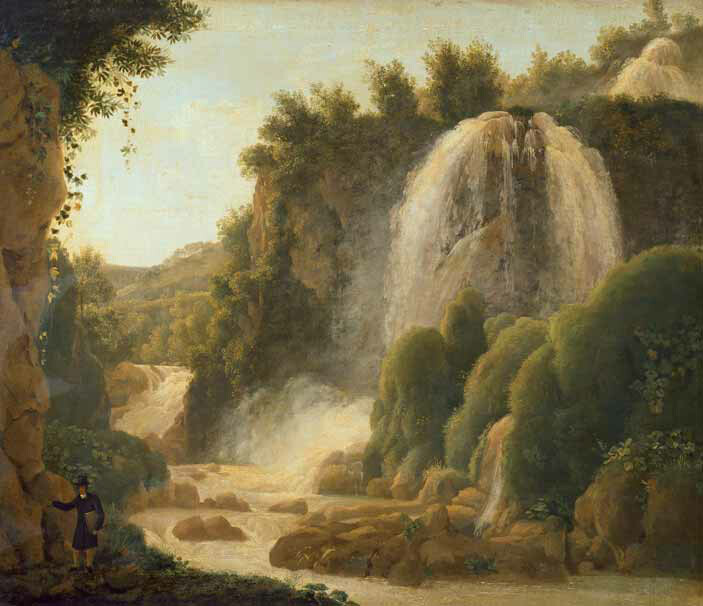 The local waterfalls had been a magnet for more than one generation of European landscape artists, and students of the St. Petersburg Academy of Fine Arts were introduced to the views of Tivoli, painted by the 18th-century Western European masters, during their years of study. 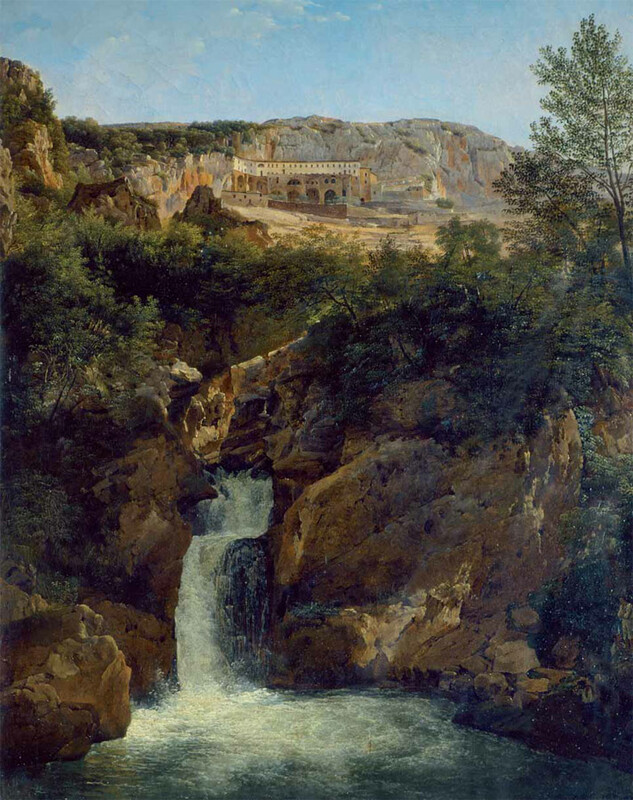 The locality imaged on another painting, bought by Tretyakov under the name “Waterfall in Tivoli”, was identified only recently. As it turned out, the picture features, on a rock above a stream, the Monastery of St. Benedict (San Benedetto) near the town of Subiaco. 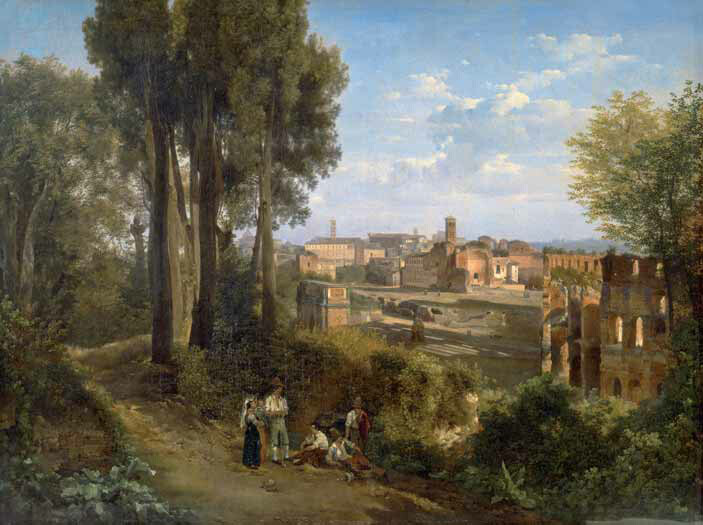 One of Shchedrin’s last landscapes in the Classicist vein was a painting symbolically titled “Old Rome”, also purchased by Tretyakov. The picture’s name is a perfect match for its “historical” content (the middle ground and the background feature the Colosseum and the structures of the Roman Forum) and the traditional technique of space structuring. However, the painting method already shows off the artist’s advanced skills in rendering colour and light. The outlines of buildings are toned down by aerial perspective, the long slanted shadows making the viewer feel that there is a real source of light somewhere near. 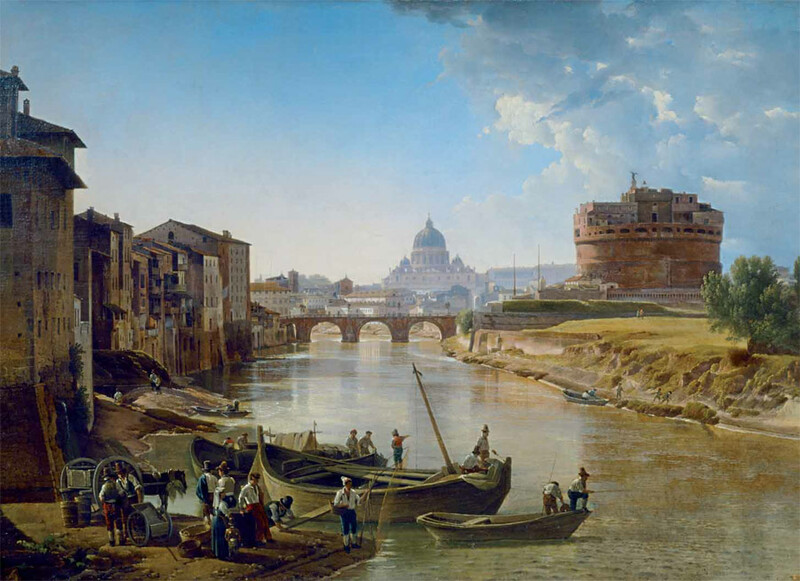 “View of the Castel Sant’ Angelo”, later also known as “New Rome”, marked a dividing point in Shchedrin’s art. The painter went on to replicate the picture many times over the following couple of years, because “this work was liked so much in Rome that many wished to have it”. Currently we know of eight replicas made by Schehdrin in 1823-1825, and the Tretyakov Gallery holds three of them. One of the paintings (the largest one) is included in the permanent exhibition. Two others are kept in the reserve fund — they are often displayed at various shows, in Russia and abroad. The pieces differ from one another, and from other versions, not only in size and details of the composition, but also in the colour design. Because of the lighting effects crafted by Shchedrin, his contemporaries compared the New Rome pieces with the paintings of the 18th-century master of landscape Claude Lorrain. However, remaining loyal to the Russian Classicist tradition, Shchedrin injected it with a content in tune with the new, romantic age. Merging majestic history and everyday life, he gave a holistic feel and a sense of completeness to the image of the city, and conveyed a ceaseless flow of life. Shchedrin’s most significant works owned by the gallery were made when his art had reached its mature stage. At that period the artist was especially fond of portraying the harbours, grottoes and terraces which abounded on the coast and the islands around Naples. 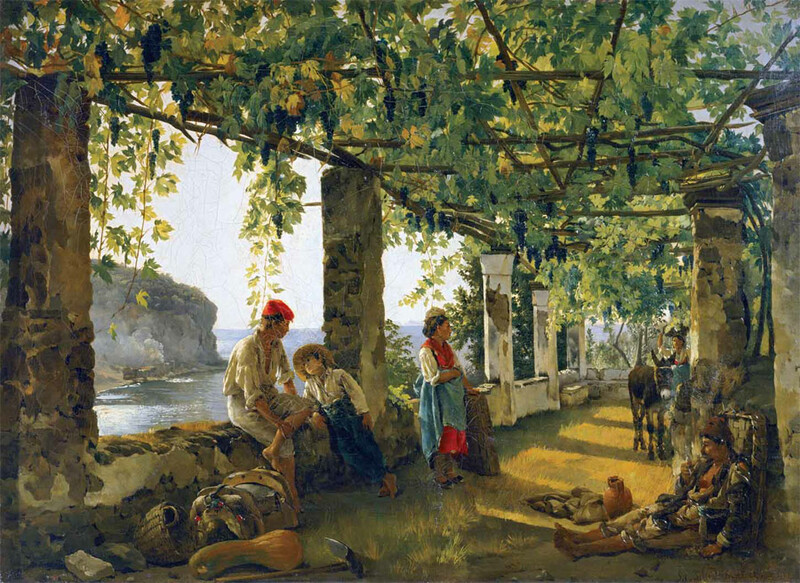 The gallery holds several Capri pictures, including a painting “The Big Harbour on the Isle of Capri”, which Pavel Tretyakov acquired in 1868 from the St. Petersburg collector Dmitry Bernardaki. Like other pieces accomplished in 1825-1830, this view of Capri bears a mark of the changes in the artist’s colour pattern. The landscape’s overall cool, slightly silvery palette brings out the dazzling shine of the southern sun and the misty film enveloping the cliffs and the vast spread of the sea. Traveling along the coast, Shchedrin preferred Sorrento to all other places. Here he worked every summer starting from 1825. 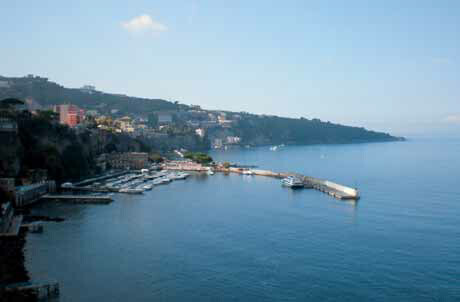 “Sorrento is the most charming place,” he wrote to Galberg, “the scenery is unmatched”,. The Gallery holds several landscapes with views of the small harbour in Sorrento. They are distinguished by Shchedrin’s trademark compositional technique — the masses of riverside cliffs are contrasted with the vast sweep of the sea. His style is marked by amplitude and fluidity, and his brushwork is agile and fluid, finely conveying the quivering of light and dark. This style also distinguishes Shchedrin’s “terraces” or “pergolas”, as he called this kind of picture. The most famous piece, his 1828 “Porch Twined with Vines”, was bought by Tretyakov, and is rightly considered one of the gems of the collection. As in other similar pieces, in this one Shchedrin combines the “interior” of the terrace on the foreground and the boundless sweep of the sea in the background. The smooth “palpability” of the brick walls of the heavily shadowed terrace is contrasted with the outdoor space and the sea, which are suffused with sunlight and seem almost unreal. Such an interaction of interior and exterior is the key element in the treatment of yet another, and the most romantic landscape motif — the cliffed grotto. 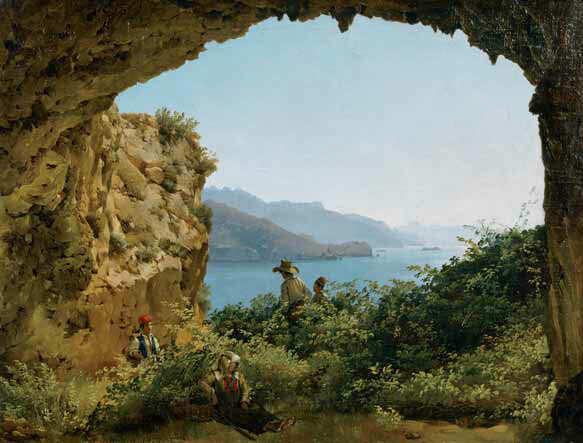 In his painting “Grotta di Matrimonio on the Isle of Capri” the artist masterfully conveyed the contrast between the rich warm colouration of the grotto’s interior and the blurred light-hued palette of the background. It may be said that the images of terraces and grottoes became for Shchedrin a symbol of sorts of the land of perennial noontide where reality seems a sweet reverie. The romanticism of the master of landscape is palpably felt in the nocturnal images of Naples, which he painted during the last years of his life. 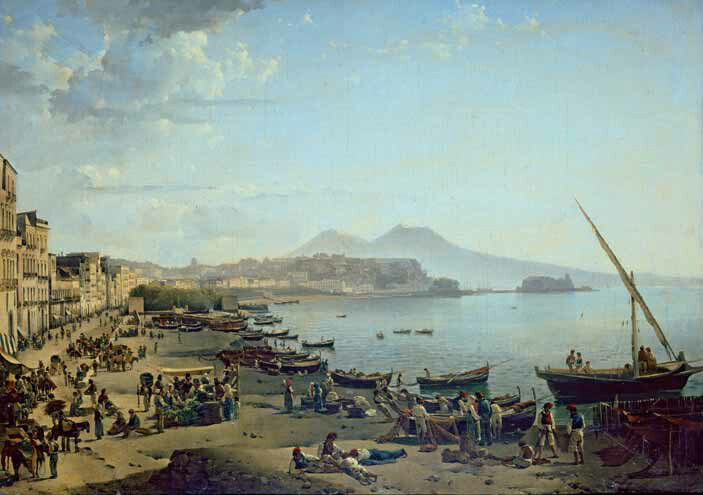 Shchedrin produced numerous pictures featuring views of Vesuvius and Castel dell’Ovo from the banks of Santa Lucia and Riviera di Chiaia, as well as other settings popular with art lovers. One of these landscapes is held at the Tretyakov Gallery. The artist combined two sources of lighting — the apparitional light of the moon surrounded with puffy clouds, and the ruddy gleam of a fishermen’s fire on the shore. The contrast of warm and cool hues accentuates the dark silhouettes of city buildings and the castle on the horizon. The image is no longer lyrical, but rather fraught with drama — its beauty provokes anxiety and a vague sadness. Thanks to Pavel Tretyakov’s efforts, by the turn of the 20th century the collection of Shchedrin’s works he put together reflected nearly all the important stages of the artist’s evolution. With Shchedrin’s pieces from private owners added in the years that followed, presently the collection of the artist’s works includes more than 30 paintings, most of which are masterpieces — recognized not only in Russia but internationally as well. Shchedrin, Sylvestr. Letters from Italy. Efros, Abram, ed. Moscow-Leningrad, 1932. P. 104. Shchedrin, Sylvestr. Letters from Italy. Efros, Abram: foreword, editing, comments. Moscow, 1932. P. 214. See: Shchedrin, Sylvestr. Letters. Moscow, 1978. Pp. 122,124-125, 164. “Shchedrin". Pamyatnik iskusstv [Monument to arts]. V. 1. StPetersburg, 1841. P. 14. Shchedrin, Apollon. Letters to Italy to his brother Sylvestr. 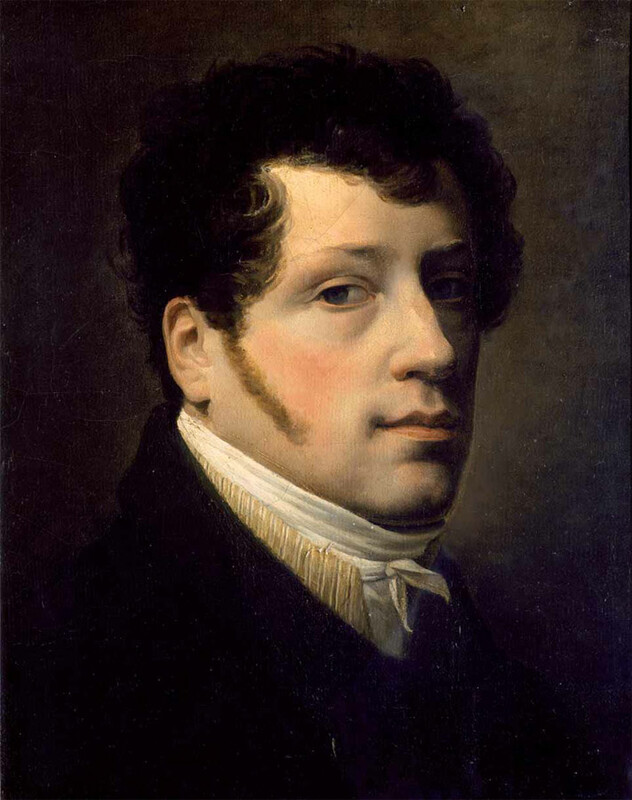 1825-1830. StPetersburg, 1999. P. 16. “Case of the demise of artist Shchedrin and property left thereafter". Archive of Foreign Policy of Russian Empire. Fund 1. File 22. Part II. Folder 16. 1830. Sheets 4 and 4 reverse. Department of Manuscripts of the Tretyakov Gallery. Fund 1. Item 4727. Sheet 1. Department of Manuscripts of the Tretyakov Gallery. Fund 1. Items 4292, 4293, 4294. Shchedrin, Sylvestr. Letters from Italy. P. 116. In 1896 Nikolai Bykov offered Ilya Ostroykhov to buy from him several paintings, including Shchedrin's “Waterfall” “featuring the image of the artist himself” for 200 rubles. Department of manuscripts of the Tretyakov Gallery. Fund 10. Item 1988. Sheet 2. Shchedrin, Sylvestr. Letters from Italy. P. 35. 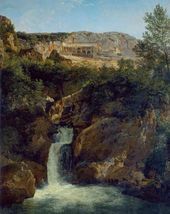 “View of the Waterfall near the Monastery of St. Benedict (San Benedetto) in Subiaco”. 1822. Oil on canvas. 59 by 46.8 cm. ID: 184. See: Yevseviev, M.Yu. “New attribution of Sylvestr Shchedrin's painting “Waterfall in Tivoli” (1822) from the Tretyakov Gallery”. Puninskie chteniya'99 [Punin Conference '99]. StPetersburg, 1999. Pp. 27-34. Grigorovich, V.I. “On the state of the arts in Russia”. Severnye tsvety. St.Petersburg, 1827. P. 22. “New Rome. Castel Sant' Angelo”. 1824. 44.7 by 65.7. ID: 5197; 1825. Oil on canvas. 63.9 by 89.8 cm. Tretyakov Gallery. ID: 186; 1825. Oil on canvas. 45.6 by 67.2 cm. ID: 5194. Shchedrin, Sylvest. Letters. Moscow, 1978. P. 105. 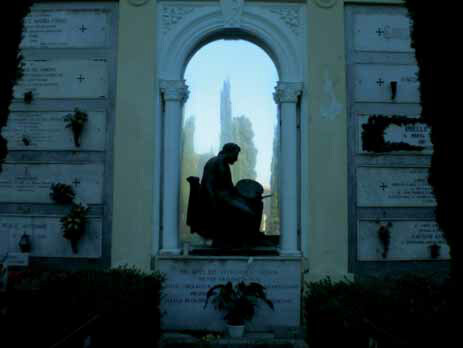 Cemetery in Sorrento. Monument to Sylvestr Shchedrin.